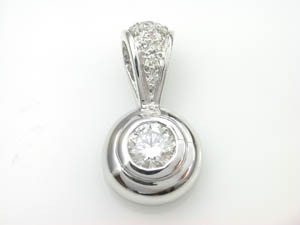 Ladies 18ct White Gold Diamond Pendant. Diamonds 18ct White Gold Pave Set Centre Gents Wedder. 18ct White Gold Pave Set Centre Gents Wedder. 18ct White Gold Pave Set Centre Gents Wedder.| TDW 8=0.06ct G/VS.